Of course, I do not consider this an exhaustive list. 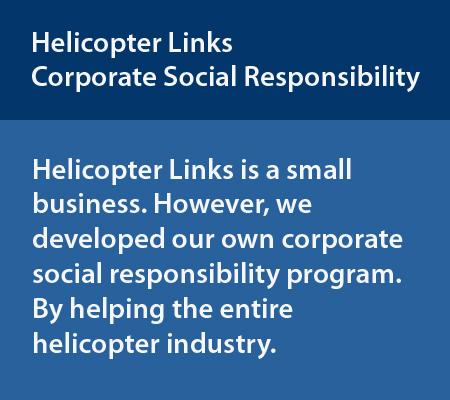 And in our case, Helicopter Links has done something unique by creating our own corporate social responsibility program. Helicopter Links website alone, is a free to use for anyone which is a comprehensive helicopter industry international directory. We list this type of companies, events and associations in the helicopter industry. We write various articles about how Helicopter Links can help advertise your company, specific articles concerning the helicopter industry, advertising tips, marketing tips, website tips, social media tips and other articles about science or an item or two about our thoughts on current day affairs. We also field any phone calls (at no charge, that is we don't hang up on them) from people around the world asking specific questions about the helicopter industry in general, helicopter trade shows and helicopter associations. We offer one free listing (one free listing is not advertising!) to every helicopter related company in the world as long as we have a category (web page) for that type of business or organization. Restrictions can apply. We post selected helicopter news on a daily basis. We post helicopter safety articles. (Specifically, we repost about 99% of every Facebook and Twitter post by the International Helicopter Safety Team, all "Helicopter Safety Of Tips Of The Week" posts by Helicopter Association International, and we post many safety articles from multiple helicopter magazines, helicopter associations and other news sources. We keep a list of safety articles and repeat them throughout the year. We post helicopter history articles throughout the year. We post helicopter trade show information. We promote several helicopter associations throughout the year. We post articles about women in aviation every year. We post helicopter cartoons through the year. We make custom helicopter-related graphics and posts these for major international holidays to help with good cheer. With Helicopter Links website, our Facebook and Twitter pages, we've help thousands of people each year, around the world, to find helicopter information, companies and more. We've also helped thousands of helicopter operators, manufacturers, suppliers, services, associations, magazines and museums in the helicopter industry around the world by posting their free links on our website, allowing new customers find their business. 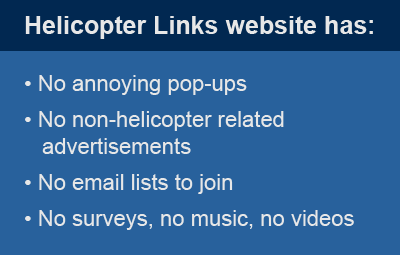 In fact, my guess is that most of the companies listed for free on Helicopter Links website, probably don't even know they are listed on our site. I feel by helping the entire helicopter industry on a worldwide basis has some merit. I hope you agree! What else do we do here at Helicopter Links to make our website user friendly? We've designed Helicopter Links website using what is called flat web design. This makes it as easy as possible to navigate our website and also, makes it very difficult to get lost on Helicopter Links website. This is due to how it's intuitive for users on how to get back to the homepage and/or how to get to the Site Map. Helicopter Links has good Search Engine Optimization. We can see through Google Analytics (sometimes called the gold standard of web statistics), that many of our users performing a web search to find a company in the helicopter industry, has brought them to the correct Helicopter Links web page. This is how easy it is to use Helicopter Links. A visitor clicks to go to our Site Map (a table of contents). Their second click on the company category they are looking for (such as helicopter engine repair companies). Therefore, they have now navigated to the correct web page they were searching for with only two (2) clicks! On that web page, all companies are listed by major continent. This makes our website easy to use because no one has to keep drilling down into our site to find more information. We intentionally have made Helicopter Links website to be annoying-free. We have no logon to use our website, absolutely no pop-ups, no music or videos automatically playing and no non-related helicopter advertisements, that is, we forbid any Google Adsense Ads or any other type of affiliate advertising on our website. All the advertising on Helicopter Links website is paid advertising from companies in the helicopter industry. Therefore, when buyers from the helicopter industry use our website, they intuitively know they are on the correct website and will feel comfortable clicking on any banner ad advertising or links because they know it's all helicopter related. Helicopter Links can be safely used in a quiet office environment without any worries that loud music will start playing without the user's permission. Personally, if I ran a large company, before I gave any money to charities to be socially responsible, I'd first make sure my employees were being paid enough, had all the insurance and benefits they needed without any co-pays, made sure they each had at least 30 (or probably more) days off each year when first hired (without the nonsense of having to "earn" days off based on years of service), holiday bonuses and things of this nature. To be responsible first - to the company, its employees and its products. But that sounds like another entire article! Back to the article. However,, corporate social responsibility does not come without problems. 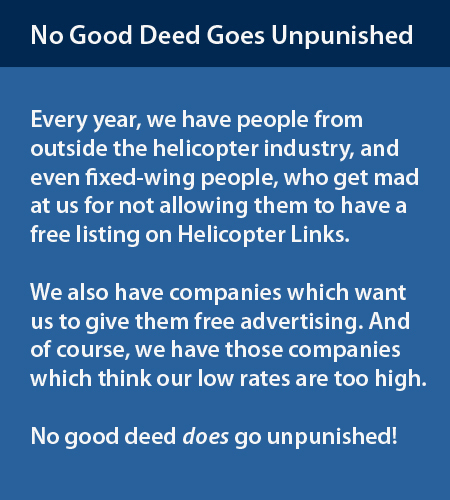 We've find out every years at Helicopter Links that no good deed goes unpunished! I am not sure why human nature is like this but it seems like some people can succumb to a bad type of thinking. With offering free listings, it also brings some problems. There are a few people who think we owe them a free listing regardless if their request is legitimate or not. For example, we have companies, organizations and private people who gets mad at us because we won't provide a free link to a fixed-wing company (or organization) or to a non-aviation related company (like a plumber or restaurant)! In addition, we also have business owners who ask us for free advertising. They will make the false claim, "If you give us a free advertising for a year, so that you can prove that your advertising works, then we'll buy advertising from you." I guess some people think that we just fell off the pumpkin truck, yesterday! No, we did not just fall off the pumpkin truck and do not appreciate it when companies try to scam us! And there's more. While our advertising prices are affordable and fair, there are some business owners who think our advertising prices are too high! I guess some people can't see a good deal when they are offered one. We do have several clients who tell us our prices are too low. It's nice to know that some business owners know a good value when they see it. Finally, if you are an owner of a business in the helicopter industry, marketing manager, CEO or have influence in your company where your advertising money should go, I ask you to please consider calling us and allow us to discuss your advertising needs and see if our advertising options and prices can help your business. Please feel free to give me a call +1 (858) 413-7074 or email me at staff@helicopterlinks.com and let's discuss how Helicopter Links can help your company advertise to buyers in the buying process, who are in the helicopter industry.